We jived to blazing blues while sipping and pouring reds and whites at the West End Celebration in Sand City. We bumped shoulders with classic car enthusiasts at the Barnyard’s annual Ferrari Event. We slipped into our kitten heels and pearls, channeling the stunning Audrey Hepburn, for Pinpoint's Blockbuster Wine & Movie event. We supported fundraising efforts for Girls Inc at their Wine and Chocolate event at Tanimura and Antle. We twirled and tasted under the elegant shade of the Carmel Plaza for the Summer Series Food & Wine Fest. We looked sharp in business casual while pouring for the Professional Women’s Network as part of a fundraiser for Rising International. And we slinked in our finest and palest of hues at the exclusive Pebble Beach White Gala to benefit The Kinship Center of Monterey. It’s that time of year again where we get ready, get set, and go—straight down the rec trail from Lover’s Point at a jaunty clip in support of the Juvenile Diabetes Research Foundation. Runners, walkers, crawlers and strollers are all welcome to participate in this enthusiastic fundraising opportunity. Arrive early for music, games, and excellent warm up dancing, and bring all your fitness-minded friends to help raise awareness for Type 1 diabetes. If you’re feeling generous but not quite as energetic, you can donate to our team—The Wine Walkers—at this link here. 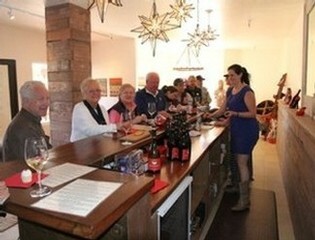 You can also make a donation at our tasting room to be entered into a drawing for a fabulous Dawn's Dream gift basket. Type 1 diabetes is a life threatening autoimmune disease that strikes both children and adults suddenly and impacts their life forever. It can not be prevented and there is no cure. 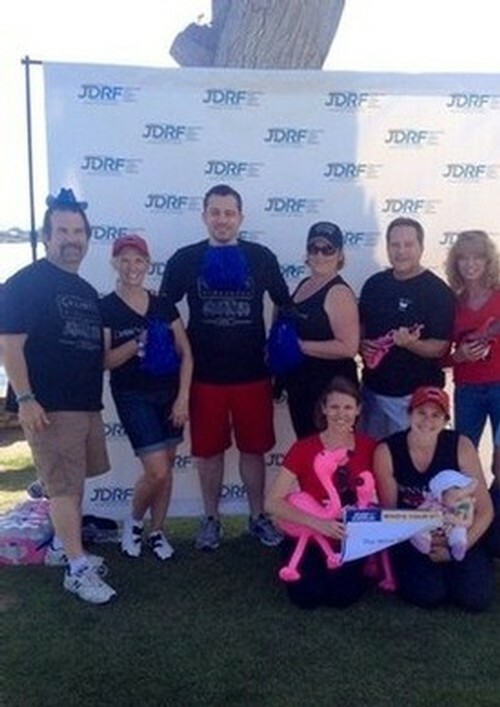 JDRF is the only global organization with a strategic research plan to fight T1D. Contact us today with any questions or to join our team Let's help create a world without T1D! 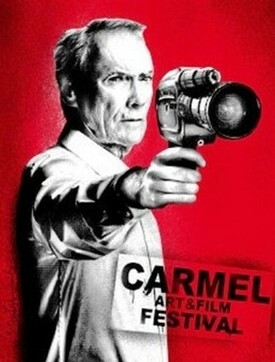 Known for its place among the world’s finest film festivals, the Carmel Film Fest is lauded for its unparalleled setting, eclectic features, and of course—the parties. Dawn's Dream will be pouring at the opening ceremony on Wednesday, October 15th to help set the tone of this entertaining and inspiring event. Come celebrate with us as we kick off the week long event at the Sunset Center with local wines and light fare. From the Filmmakers Reception to the VIP Cocktail Parties, and everything in between, there is something for everyone. Purchase your tickets online today as every year they sell out quickly. Attend a selection of events, sponsor a table at the lavish dinners and evening events, or purchase the premium package to receive tickets to all events and hotel accomodations. Being such avid art lovers here at Dawn's Dream, we want to extend the invitation for you to relax, sip your favorite pinots, and try your hand at painting under the artistic direction of Graciela Placak. Most of you are already familiar with her beautiful work as it graces the walls at our tasting room. Meet Graciela, learn about her art and career, and create your own masterpiece as she guides the group through a personalized painting experience. This event is a rare opportunity with very limited availability. The cost per person is $115 including wine flights, a light lunch, your individual canvas with painting supplies, and professional instruction. Meet new friends or discover a new favorite hobby as you watch our tasting room transform into an art gallery to rival the finest in Carmel. Contact Maegan today to reserve your seat. If you can not attend the morning event please still join us as we open our tasting room later in the day for an "Afternoon of Art" from 2:00-4:00 pm. 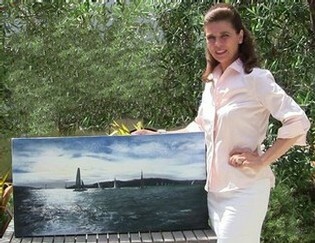 Graciela will be giving live demonstrations and all of her work will be on display for discussion and purchase. 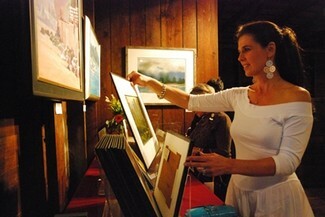 Stroll the gallery with your wine as you decide which masterpeice needs to go home with you. No RSVP is needed for this portion of the event. Wine flights and gourmet cheese plates will be available for purchase. We look forward to seeing you! The holidays are the most difficult time for foster children and one of the most painful issues for them is not being able to acquire gifts to give to their foster parents and family members. We are delighted to partner with our neighbors, the single most historical toy store in all of Monterey County, Thinker Toys, and the fashionable and fun clothing store, Ms. Fabulous, to provide gifts for children, teens, and adults in support of Voices for Children. Thinker Toys will be offering 25% off any items purchased for this cause between Nov. 1st through Dec. 6th. Ms. Fabulous will be offering 20% off any item purchased on Dec. 6th ONLY. And Dawn's Dream will give a $10 voucher to spend at our tasting room in any way you like—wine flights, bottles of wine, retail—when you bring in any donation from Nov. 1st through Dec. 6th, the day of the event. In addition to the festive atmosphere that charitable giving provides, we will be offering live holiday music from locals Terry Shehorn & Mike Moratta, delicious light fare, and of course, your favorite wines. Please contact Maegan with any questions. It’s been a while—and don’t we know it—since we’ve been graced with the elegant fruit of the Rachael and Alyssa Pinot Noirs. Finally, we can announce that Rachael is back with all the panache of her previous incarnation, but this 2013 vintage hails from the rugged terrain of Arroyo Seco and brings to us the cool, breezy afternoons and long ripening season in fruit-forward flavors of bright cherry and succulent pomegranate just before finishing with the warmth of baking spices and anise. Alyssa builds upon her earlier profile, this time offering aromas of overripe strawberries and decadent chocolate pudding. Punctuated by soft tannins, Alyssa is resplendent with smooth textures and lingering flavors that beg you to take just one more sip. We can’t wait for you to try the newest vintages of our Three Sisters Pinot Noir Trilogy. Taste them side-by-side and take home your favorite or all three! DAWN'S DREAM FALL WINE CLUB IS APPROACHING! The wait is over! It is time to celebrate our autumnal release of the wine club alongside another successful harvest. 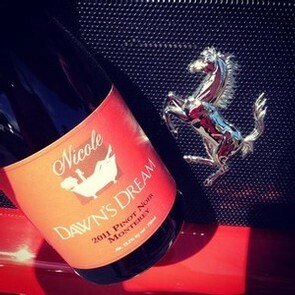 We will be enjoying tasty niblets and savoring the full array of Dawn’s Dream wines. Of course, be sure to stay and meet Dawn Galante, take your picture in our tub (#dawnstub), and take advantage of your discount to spoil your friends and family…because the holidays will be here before we know it! Part of this release will include our member exclusive 2013 "Nicole" Pinot Noir that will not be released to the public until 2015. If you are not yet a member of our wine club we encourage you to come to the event, join our "Dream Team" and enjoy your first complimentary wine tasting. DAWN'S DREAM GIFT CARDS - AVAILABLE NOW! No matter what the occassion - birthdays, weddings, thank you's, anniversaries, holiday gifts, or a just because - we now have your simple and very coveted solution: Dawn's Dream Gifts Cards! Share the wine experience that you've come to love with those that YOU love. Use them as stocking stuffers or company party favors and invite your coworkers, family, and friends to begin their own exciting and delicious relationship with Dawn's Dream Winery. The gift cards are available now for purchase at our tasting room, on our website, or over the phone at (831) 659-2649 in denominations of $25 and $50. Give the gift that will excite everyone and who knows, they might even share some of their fabulous wine selections with you! We can hardly believe that the holiday season is right around the corner but we are ecstatic for the elaborate and flavor packed dishes that beg for the perfect wine pairing. The following recipes are a fun twist on traditional Thanksgiving favorites and the ideal selections to pair with our 2011 Nicole Pinot Noir. Whether you enjoy this pairing while the turkey is piping hot, fresh out of the oven, or the following day with a cold turkey sandwich while watching football, you will not be disappointed. 1) In a very large bowl, whisk together the soy sauce, honey, sesame oil and half of the ginger. Put the turkey in the bowl, breast side down, and marinate at room temperature for 45 minutes. Turn the turkey and marinate breast side up for 15 minutes. 2) Preheat the oven to 350 degrees. Set a rack in a large roasting pan. In a small bowl, combine the salt, pepper and five-spice powder. Remove the turkey from the marinade; reserve the marinade. Set the turkey on the rack, breast side up, and season it inside and out with the salt mixture. Stuff the cavity with the scallions and the remaining ginger. Turn the turkey breast side down on the rack. Add 2 cups of water to the roasting pan. Loosely cover the turkey with a foil tent. 3) Roast the turkey for 4 hours, basting with some of the reserved marinade every hour and adding a total of 3 cups of water to the pan during roasting. Turn the turkey breast side up and baste well with the reserved marinade. Roast uncovered for 30 minutes, basting once halfway through cooking. The turkey is done when an instant-read thermometer inserted in the thigh registers 165 degrees. 4) Carefully pour the juices from the turkey cavity into the roasting pan and transfer the turkey to a carving board. Let rest in a warm place for 30 minutes. 5) Meanwhile, strain the pan juices into a large saucepan and skim off the fat. Add the chicken stock to the juices along with 3 cups of water and bring to a boil. 6) In a medium bowl, blend the butter with the flour to make a smooth paste. Gradually whisk in 2 cups of the hot pan juices until smooth. Whisk the mixture into the saucepan and bring the gravy to a simmer, whisking constantly, until thickened. Simmer the gravy over low heat, whisking occasionally, until no floury taste remains, about 8 minutes. Carve the turkey; pass the gravy at the table. 1) Preheat the oven to 400 degrees. Spread the sweet potato chunks in two 9-by-13-inch baking dishes. Add 1 cup of water to each dish, cover with foil and bake for about 25 minutes, until the sweet potatoes are barely tender. Pour off any remaining water from the baking dishes. 2) In a small saucepan, combine the brown sugar with the butter, five-spice powder and nutmeg and cook over moderate heat until the butter is melted and the mixture is bubbling, about 4 minutes. Pour the mixture over the potatoes, stir to coat and season with salt. Bake for about 10 minutes, basting a few times, until the potatoes are tender and nicely glazed. Sprinkle the almond toffee over the potatoes and serve. 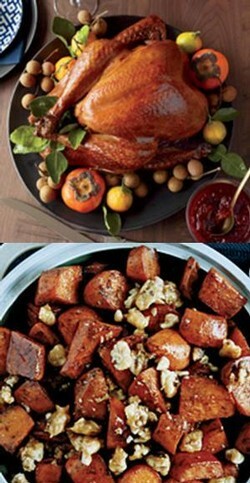 **The glazed sweet potatoes can be refrigerated overnight. Reheat before topping and serving. For more information or to attend any of our upcoming events click on the links below or contact Maegan.